Give A Gift From the Land! 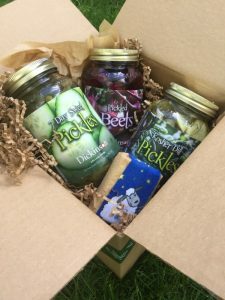 Farm-made gift boxes are a great way to share a taste of the farm with others! Our products are made with certified organic vegetables and other wholesome ingredients. Gift boxes offer a variety of combinations that promise to satisfy your appetite for seasonal goodness in a jar! These unique gift boxes are great for teachers, neighbors, family and foodies in your life. We take pride in hand packaging these individualized boxes and knowing that we are sharing our bounty with friends, near and far. All items can be special ordered and packaged for the upcoming holiday season. Our products are made with Certified Organic ingredients from the College Farm and aim to please! Supplies are limited, order today!